The last post showed you how to make temaki sushi. This post gives you the recipe for the temaki sushi shown in the how-to post! This one is soooooo good. I didn’t think bacon, green onion and cheese would be anything really special. Quite frankly I had forgotten to get ingredients for this post and just used what was in my fridge at the time! Surprisingly, this one is amazingly good! Bacon goes with just about everything, of course, and the green onion brightened it up a bit. Add a bit of creamy cheddar cheese, and BAM! 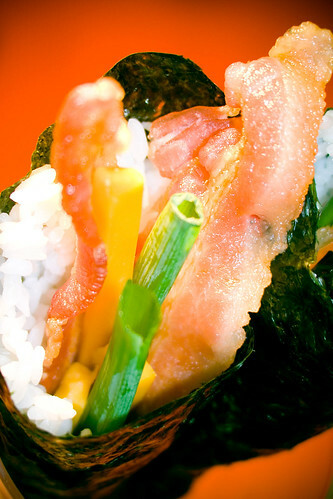 you have got an amazing temaki sushi! Believe me, you will *scream* “Yum!” when you try this one! Cook bacon in frying pan or microwave bacon, until it is as crispy as you like it. Break each slice in half. Wash the green onion, cut the long green stalks off of the white bulb-like things. Discard (or pickle) the white bulbs. Break each stalk in half. Quarter each slice of cheese. 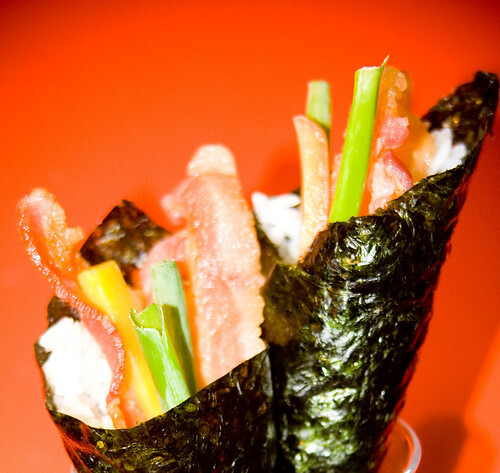 Roll the temaki sushi, using two green onion halves, two bacon halves, and four cheese sticks as your fillings. is there anything you can do to cut down on the tough part at the bottom…whenever I made it or ordered it when you’d get to the bottom where all the nori was together the most it was really tough and chewy. I love the site, the pictures makes the food so inviting. I’m going to try the bacon crunchy roll and the frisky roll tomorrow! Ralph – I would recommend putting rice all the way to to bottom of the nori, so there is rice down there instead of just soggy nori. Since the rice is sticky, this should be fine because the rice won’t fall out of the bottom of the cone. I add up the calories from the individual ingredients in the sushi. 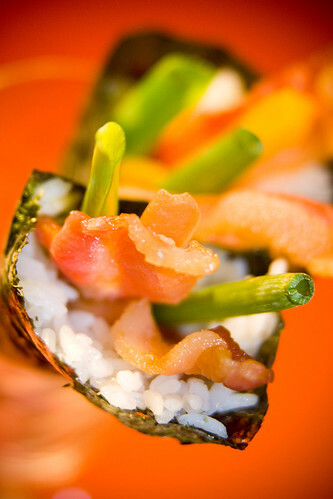 One roll of maki has 6-8 slices of sushi, and is usually about enough for one person (unless they are a big eater.) One cone is about equivalent to 1/3 of a roll of sushi.